Twenty years ago, on January 17, 1998, the Global March movement began with an 80,000 km physical march when millions of people marched together to put forth the message against child labour. As a strong and united voice for NGOs, trade unions, teachers’ associations and individual activists, the Global March has played its part in reminding the international community world that all children must be protected from exploitation and abuse. It also worked closely with partners in highlighting the link between the prevalence of child labour and poor access to and quality of education. Child labour itself was not acknowledged, either in social or political domains, and was considered acceptable and a norm for children from poor and vulnerable backgrounds. Further, despite the pervasiveness of child labour across the globe, with more than 250 million child labourers, there was no singular international legislation for tackling its worst forms back in 1998, and no collective campaign efforts taken to advocate for it. Global March was thus originated to fill this gap and a worldwide campaign was launched that mobilised 15 million people who demanded for an international law on ending child labour, the ILO Convention 182 on Worst Forms of Child Labour which was unanimously adopted in 1999 and is considered one of the fastest ratified Conventions in the world. This Convention was formulated to supplement ILO Convention No. 138 on minimum age for admission to employment. Today, 181 countries have ratified Convention 182 till now and only 6 countries remain to ratify the same. ILO Convention 138 on the other hand has been ratified by 171 countries, leaving 16 countries to make efforts for its ratification. Global March, which started with a small group of motivated partners has come a long way in the course of last 20 years, and has contributed in bringing about significant changes in societies around the globe to see a world free of child labour. Earlier there was a lack of understanding on the cross-linkages with other socio-economic issues such as poverty, illiteracy and decent employment. But over the years, there has been a paradigm shift in the approach towards child labour and it has been recognized as a socio-economic issue with linkages to other development issues. Since the beginning of the millennium, Global March has been at the forefront in bringing awareness on child labour in products such as footballs, carpet, agriculture, chocolate, and in domestic work. In 2002, Global March launched its historic World Cup Campaign, to put a spotlight on use of child labour in the sports goods industry. Simultaneously, Global March also drew attention on the invisible form of child labour in domestic work and repeatedly campaigned in 2002, 2006, 2010 and 2013 to advocate for an end on child domestic labour and to protect the rights of such children who faced slavery like situations in domestic homes, carrying out hazardous work. Global March also actively campaigned to expose the chocolate industry by showing the use of child labour in the same, along with advocating with the chocolate companies to mend their practices to address child labour in their supply chains. 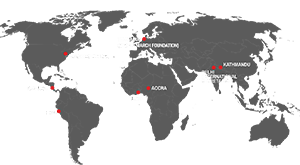 Global March thus initiated action with the industry on the employment of child labour in Cocoa farms through Global March’s Cocoa Campaign in 2003, leading to the establishment of the International Cocoa Initiative. Further in 2003, 2004 and 2005, Global March organised the High Level Round Table Meetings, which culminated in the formation of the Global Task Force on Child Labour and Education, which was the first-inter agency collaboration by Education International, ILO, UNICEF, UNESCO, UNDP, Global March and the World Bank, to work on the inter-linkages between child labour abolition and education for all. With such efforts, child labour has now come to be recognised as an obstacle for the achievement of the global goals set between 2000-2015 such as the Education for All goals, Universal Primary Education, Millennium Development Goals and now the Sustainable Development Goals. In 2012, Global March was successful in organising the first ever International Conference on Child Labour in Agriculture bringing together 160 stakeholder representatives from over 40 countries around the world to discuss ways to eliminate child labour in agriculture where half of the child labour worked back in 2012. Today, in 2018 it is said that 70% of child labourers work in the agriculture sector of the 152 million child labourers all across the world. Recognising the need for inclusion of the terms ‘child labour and slavery’ in the Sustainable Development Goals, which replaced Millennium Development Goals in 2015, Global March advocated for the inclusion of these terms through persistent and years of lobbying, advocacy and the End Child Slavery Campaign. Global March’s intervention “Not Made by Children” programme also worked towards strengthening the efforts against child labour and trafficking for forced labour through improvement of inspection and monitoring processes in garment supply chains, providing comprehensive remediation of victims and promoting decent work for adults. Moreover, while trafficking of children for commercial sexual exploitation was well recognised, trafficking of children for forced labour did not find a place in the policy discourse. As a result of consistent and persistent policy advocacy dialogues and engagement with partners and sustained mass awareness campaigns, trafficking of children is now also being understood as a type of forced labour and modern-day slavery. Be it the Children World Congresses, the Marches Against Child Trafficking, or regional and national consultations, trafficking of children for forced labour has been highlighted by the Global March and its partners. 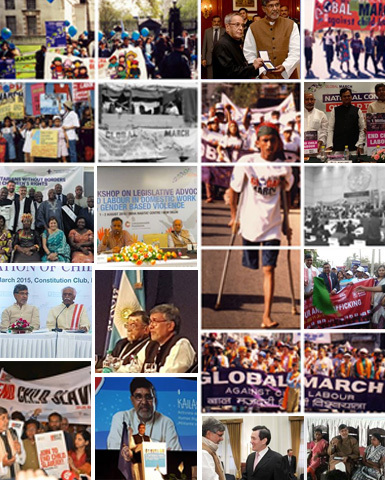 From 1998-2018, Global March has travelled a long journey fighting assiduously for the rights of children of all children in the world to access free, quality, inclusive and equitable education and enjoy a childhood free of exploitation. Today, we are fighting alongside some of the strongest partners across the globe as a member of the Global Coordinating Group of Alliance 8.7, the global partnership to end child labour, modern slavery and human trafficking by 2025. The 20th anniversary of Global March therefore gives a renewed opportunity to reflect – to look back on Global March’s history and take stock of its enduring achievements. It is also an opportunity to spotlight where Global March – and the international community as a whole – needs to redouble its efforts to meet current and future challenges to ensure an end to child labour till 2025. Global March looks forward to the coming years with optimism and great anticipation, and determination to revitalise and strengthen the worldwide movement against child labour, to protect vulnerable children and ensure they can benefit from their fundamental rights.